Demonstrating looser, almost impressionistic brushwork, this painting emerged from a pleasant summer that Paul Peel spent in Brittany, France with his fiancée and fellow painter Isaure Verdier. Peel’s decision to portray an oblique perspective on the courtyard is also unusual, perhaps suggesting the modernizing influence of photography over the balanced, Classically-inspired compositions so common to the Western painting tradition since the Renaissance. 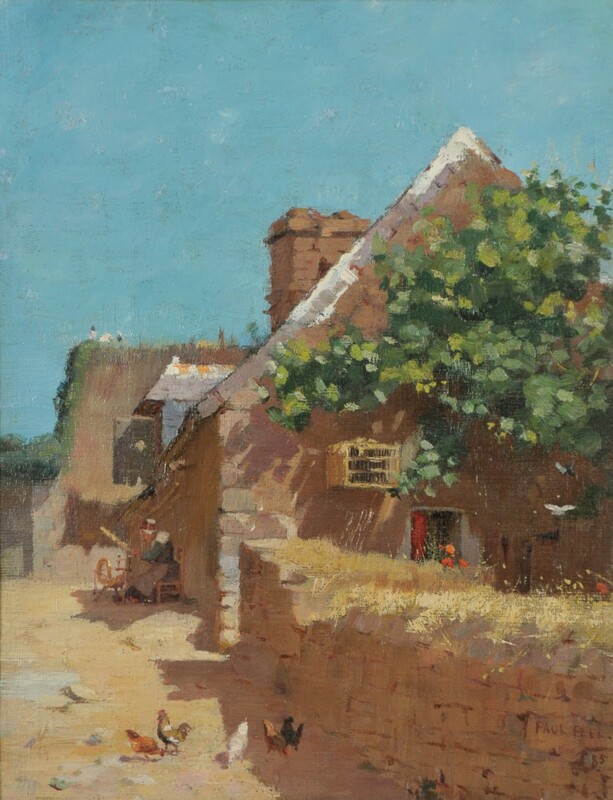 That Peel enjoyed the people, natural surroundings, and unique quality of light in Brittany was obvious: he summered in the region frequently over a period of seven years, and encouraged his fellow Canadian painter, Florence Carlyle, to join him there in 1889. Carlyle would be inspired to create Mère Adéle, also in the permanent collection of Museum London. Peel, meanwhile, created a series of light-infused works that expanded his palette along with his artistic technique.